We're counting down to the 2014 World Cup! 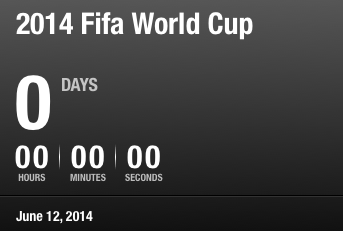 With just two days left until the 2014 Fifa World Cup commences (Brazil vs. Croatia will be aaaammmmaaazing!) we're getting in the spirit! On June 12th, 32 countries will meet in Brazil for the biggest soccer (oops! football) event in the world. Our own Austin Verville, production/account assistant, starred in this PUSH 22 production to lead our staff in the excitement...and maybe show off his skills a little. We want to know, how are you celebrating?